Met with Allison today. Weighed 167, so a total of 27 pounds gained and a pound/week since 35 weeks. More than the 25 total I would have liked, but oh well. It's so hard here at the end, where I feel like I'm done and can indulge...plus, I'm craving junk and sweets and just FOOD like nobody's business. Blood pressure was OK and baby's heartbeat was great. Talked a lot about labor. Forgot to bring my birth plan with me. Again. Not that it matters so much for Allison and Tina as it does for the hospital nurses, once we get there, but I'd still like them to have it. 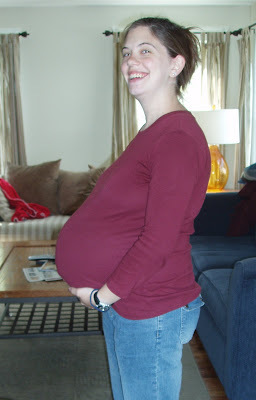 Here's a shot of me today, with 1.5 weeks left until my due date. Two words come to mind: POINTY BELLY. Pointy is right! My internet is back so I can check in on you! Hello..glad no one got hurt in the backyard tumble and the bedding is super adorable! Are you sure you want a blue quilt to go with all that red? ?